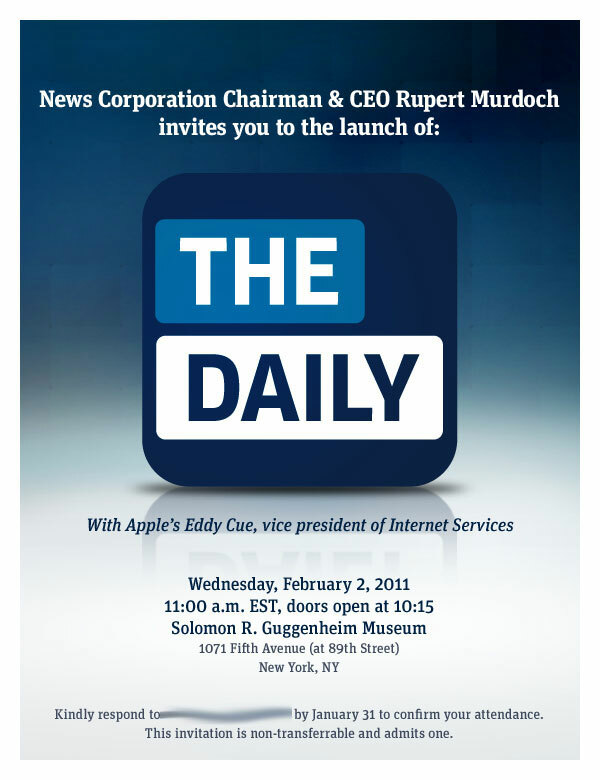 Tomorrow, News Corp and Apple are scheduled to introduce, and hopefully, launch, a new digital only newspaper for the iPad called The Daily. The Daily will be provided by a new subscription service Apple has been developing as part of their iOS and iTunes ecosystem. An update to iOS 4.3 is in the works, however, it is not yet clear if that update or an update to iTunes is required to enable the new subscription service. If the rumors are correct, subscriptions to The Daily will cost $0.99 a week, a very reasonable price in my opinion. There has been some chatter on the Internet about whether or not The Daily will be heralded as a success or if it will be a bust. Those who think it will be a bust point to the face that there are plenty of news websites that are free on the Internet, and they are correct. On my iPad, I have the New York Times, Washington Post, and USA Today apps loaded. The first two have already indicated that they will start charging for access to their news. USA Today, as far as I know, will remain free for the time being. For me, there lies the rub. I'm looking to cut costs and the writers who work hard every day to bring me news from around the world want to get paid so they can put food on the table. And that is why I'm willing to give a subscription to The Daily a try. The price is right and with only a half dozen sections, I can read the entire edition even on my busy schedule. 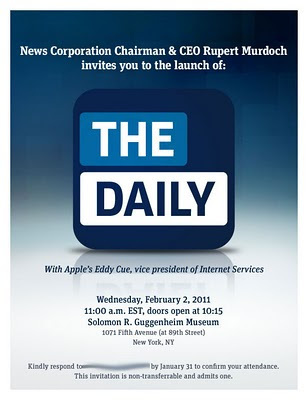 I'll be interested to see what gets unveiled when News Corp Chairman & CEO Rupert Murdoch and Apple Vice President of Internet Services Eddy Cue take the stage tomorrow morning in New York.